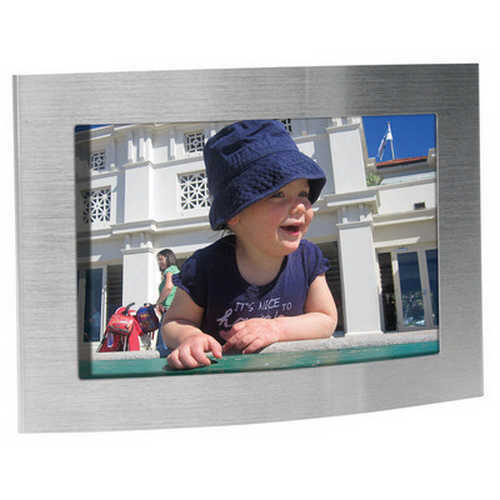 Brushed stainless steel frame. Slight curved to add a dimension to the photo. Suitable 4 x 6 photo. Subtle tone on tone branding for laser engraving. Gift box. Product Size: 180 x 130 x 20mm. Product Packing: Boxed. Decoration Size: 45 x 14mm. Decoration Position: Front face. Decoration Method: Pad Print | Laser Printing. Carton Quantities: 36. Carton Size: 46 x 20 x 41. Carton Weight: 7. Colour: Silver. Price includes : Pad Print 1 Colour / 1 Position. Setup is included.